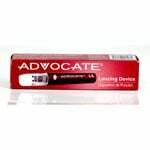 At ADW Diabetes we take pride in our excellent service and wide selection of lancet devices. Save up to 60% every day & enjoy fast delivery. 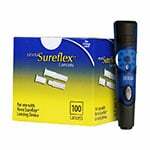 You will find all the top brands like Nova Sure Flex, Advocate, One Touch, Accu-Chek, TrueDraw and Freestyle at discount prices. 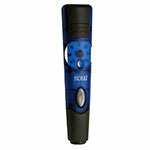 Shop our wide range of lancing devices and trust us for best prices and service. 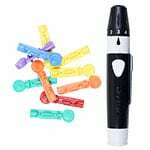 Read Specific Instructions: Since each lancet device is slightly different, you may want to read the specific instructions on your device for complete accuracy. Wash Hands: Always begin by washing hands with warm, soapy water, rinsing carefully and drying completely. Only use alcohol gel or an alcohol pad if soap and water are not available since alcohol dries out your skin. Insert Lancet: Remember, there are many different lancets, and the lancet may be specific to the lancet device. 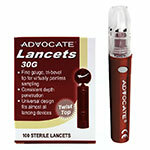 Remove the top of the lancet device and insert the lancet until it clicks or until fully loaded into the opening. 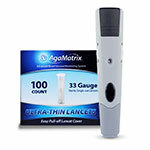 Always use a new lancet for the cleanest, easiest and safest stick. Twist Off Safety Cap: Do not remove the safety cap on lancet until this point; this will help you avoid being stuck and keep the lancet tip sterile. 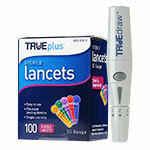 Replace Lance Device Top: You can now replace the lancet device top by either twisting or pushing until it clicks into place. Adjust Depth Puncture Setting: Depending on your skin on your fingers and hands, you will decide which setting works for you. The goal is the best blood droplet with the least amount of pain. It may take a few times to find the perfect setting. The number range will be between 1-9. The lower the number, the shallower the stick. Children and those with thin skin should use a lower setting. If you work with your hands often and have thick, calloused skin, use a higher setting for a deeper stick. Remember the shallower stick, the less pain. Engage the Lancet: Each lancet device is slightly different, but most will require you to engage the lancet by pulling back and locking the spring; this loads the lancet into place. Prick Your Finger: Hold the opening on the lancet top firmly against your finger (do not use your thumb) and press the release button. Change fingers with each stick to prevent infections or callouses. You may need to milk the finger slightly, above the stick, if you are not getting enough blood. Discuss alternative site testing with your physician, if you are interested, before using your forearm or palm due to possible inaccurate results. Obtain Blood Droplet: You should now have a blood droplet which goes directly on the pad of the strip already placed into the meter. Doing all these steps will help you avoid "error" on the meter and wasting another strip. You may need to blot finger with white gauze if you are still bleeding especially if you take aspirin or blood thinners. 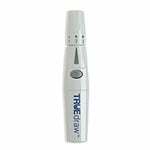 Remove the Used Lancet: Some lancet devices have an easy release for the used lancet and others will require you to pull the lancet straight out. Avoid poking yourself with the used lancet. Dispose of the used lancet and strip properly in a red, heavy, plastic container which can be purchased or find out what your state/region requires for proper disposal. Can You Share a Lancing Device? No, home use lancet devices are not recommended for sharing. By sharing you expose yourself to bacteria and blood borne pathogens. It is possible to transmit disease such as Hepatitis B or Hepatitis C. You could also be exposed to HIV/Aids if the device is shared with someone else. 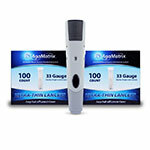 Diabetic lancet devices have several settings with multiple depths available. The higher the number, the deeper the stick which may cause more pain. Most people will require and tolerate a setting of 1-3 on the device unless you use your hands for work. Calloused, thick and rough skin may require increasing a setting to 4-5 to get a clean stick and an adequate drop of blood. Trial and error may be needed to pick a depth setting for a first-time result without pain and wasting of additional strips.